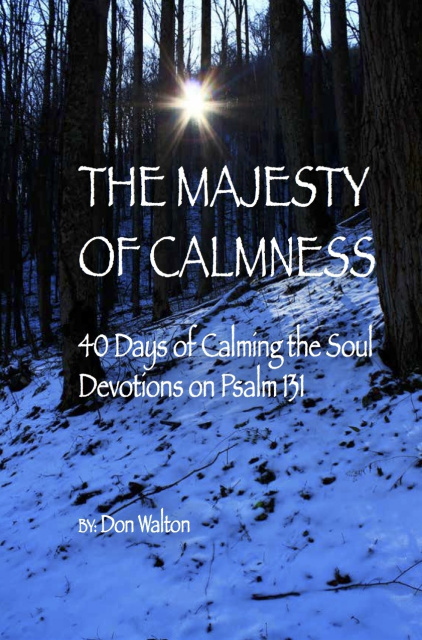 William George Jordan’s book, The Majesty of Calmness, has been called a Christian classic. I’ve read the book a few times and had it in my library for years. I must admit, however, that it has always fallen short of my expectations. It is its lack of Christ-centeredness that leaves me unsatisfied. Jordan appears to me to be looking in the wrong place for the serenity of the soul. He emphasizes self-confidence and self-reliance rather than confidence in Christ and reliance upon Him. If you ask me, there is no surer way to keep your soul in perpetual upheaval than to live your life looking to yourself rather than to Christ. In spite of my dissatisfaction with Jordan’s supposed Christian classic, the theme of his book has always intrigued me. Since my first baby steps on the walk of faith, I’ve been intrigued by the calmness that characterized our Lord’s earthly sojourn. No matter the circumstances that surrounded Him or the situation He found Himself in, the majesty of calmness was always on perfect display in the life of Christ. Whereas we may expect calmness to personify the life of the Son of God, the Scripture presents us with a plethora of glimpses of this same majesty of calmness in the lives of the people of God. When we add to these scriptural examples the fact that Christ lived His earthly life as a perfect example for us to follow, we are forced to conclude that the majesty of calmness is not an unscalable spiritual summit reserved only for our Redeemer, but one that is also possible for us to ascend. How about you? Would you like to scale the utmost height and catch a gleam of glory bright? Would you like to have a calmness of the soul that is invulnerable to outward circumstances? Would you like to possess an inner-peace that is impregnable to doubts, worries, and fears? Would you like to be shaken by nothing and able to shake off everything? If so, be forewarned that it is a steep slope to this soaring spiritual summit, but one that can be scaled with God's help if you are willing to persevere in its painstaking ascent. You have the author's permission to print and freely distribute to others this entire manuscript or any portion thereof. If you would like to help us continue to offer complimentary resources, like The Majesty of Calmness, you can make a tax-deductible donation to "Time For Truth Ministries." All contributions should be mailed to: Time For Truth, P. O. Box 811, Townsend, TN 37882.